Out shopping today at my local used bookstore and came across an early paperback copy (from 1952) of George Orwell’s 1984. A little overpriced at $15.00, but the cover called to me. What a classic! If you click on the picture, you can just make out, if you look closely, the slogans on the Ministry of Truth in the upper left: War Is Peace, Freedom Is Slavery, Ignorance Is Strength. Which one will you be in 2014? That tag line haunts me: “in a world many of us may live to see!” Hype, reader? Or prophecy? 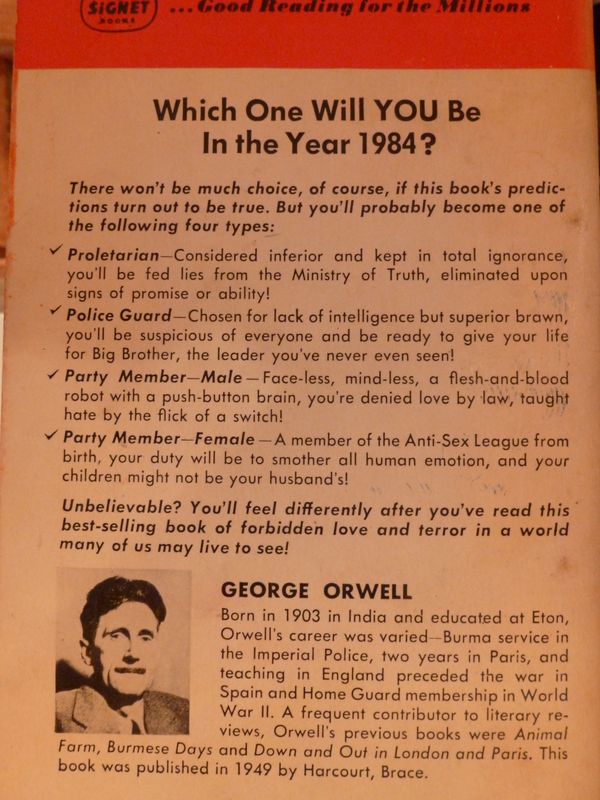 I haven’t read Orwell since college, circa 1984 in fact. Time to get crackin’ before my old copy is confiscated and sent down the memory hole. I love that book so much! Every time I read it, it has this hypnotic effect on me. I have to shake myself back into reality when I put it down because the words have this weird ability to transport you into that world. Prole here: The plutocrat state (formerly the USA) we now live in began in 1980 out of the dregs of the fiasco that was the Nixon presidency. Few in the GOP, even in its extreme right wing, in 1974 imagined in their wildest fantasies their party would rise from ~15% public approval in less than a decade. Much less to leadership of national economic, cultural, and international policy on a permanent basis. But then, at that time it was impossible to foresee the mysterious and complete abandonment of principle by the national leadership of the American left following the Carter administration, and their ideological shift rightward of Nixon. Or the abundance of media oganizations made possible by technological advances. Or the opportunity for the creation of the most powerful and prolific propaganda media ever seen on this planet, thanks in no small part to the capitulation of Fairness in Broadcasting doctrine by Democratic Party national leadership, not only via radio but also hundreds if not thousands of newly created media outlets (cable television stations and the internet). Propaganda and the authoritarian mentality. ASPD opportunists and a domestic population 25% of whom are born enthusiastic followers of simplistic, easily obeyed slogans/policies conjured and conveyed by doctrinal purists impervious evidence contradictory to doctrinal tenet. Tens of millions comfortable with, eager to be directed by, strong men. A population easily unnerved by complexity and nuance, i.e. prone to loathe reality. Eager to comply with rigid — but concisely simple — societal structure designed by (and for the benefit of) hierarchical elites. In 1974 virtually no one could predict that in less than six short decades environmental chaos resulting from carbon energy processes would result in disastrous conditions democratic institutions were unable to successfully manage, but ideal for seizure of totalitarian control by the very same plutocrats who refused to implement energy strategies that may have at least mitigated, if not avoided altogether, the worst of the CO2 and MH4 catastrophic environmental outcomes. 2034. It’s already hot, muggy, and buggy almost the year ’round, even though there is still some (fast disappearing) ice at the Poles. What’s ahead now seems certain to be at least 5 times more severe by the end of the century than predicted even two decades ago. Famine is feast, drought is draft, heat is cool, migration is constant. There is nowhere to migrate to, and nowhere gets harder to get to with each passing year. Disease is our constant companion. Interesting post. I take it by “American left” the author means the national Democratic Party. That’s a bit of a stretch! Only because the GOP has moved so far to bat-guano insane can we say there’s anything RELATIVELY “leftist” or “progressive” about the Dems. Individual scientists started sounding the alarm about human impact on the global environment as far back as the 1950s, but since these truths are inconvenient to the energy industry and the manufacturers of gas-guzzling vehicles they were shunted to soundproofed, windowless offices! I’ve felt in my gut for years now that yes, the scientists deemed “most alarmist” were still underestimating the speed with which the climate chaos beast would wreak havoc on us all. 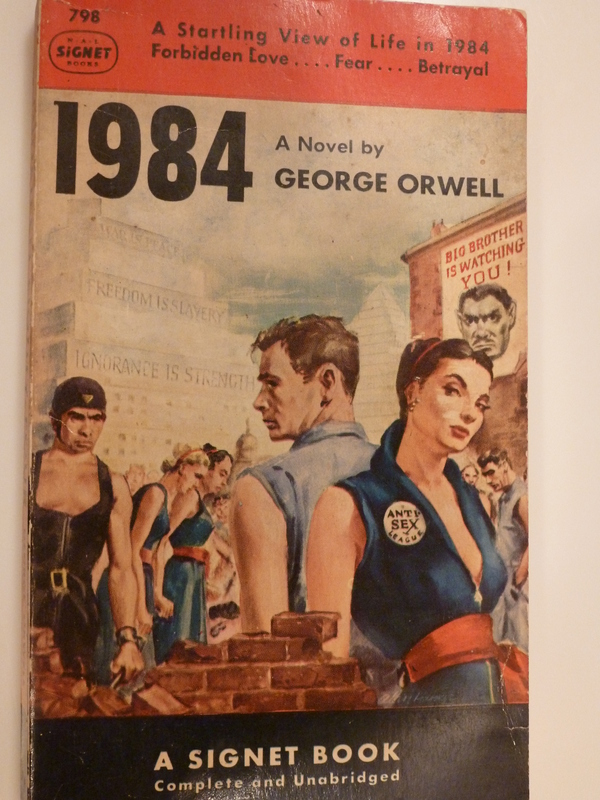 Bill Astore–Rambling thoughts on “1984”: I don’t think 15 bucks is excessive for such a vintage copy of this crucially important novel! The blurbs are delightfully 1950s-cheesy. Reading ANIMAL FARM was mandatory back in time of my schooldays and the book was used for anti-communist propaganda purposes, of course. I feel it’s important to point out that Orwell (born one Eric Blair) considered himself a socialist. It was Stalin’s perversion of the Russian Revolution to create a privileged bureaucratic caste (“We are all equal here…but some of us are MORE equal.”) and especially his betrayal of the republican forces fighting in the Spanish Civil War that made him exceedingly bitter. Likewise, the world depicted in “1984” should be viewed as a totalitarian world, not specifically a portrait of a “communistic” world. That society is constructed to protect the privileges of the self-appointed elite and espousal of specifically communist OR fascist ideology is pretty well absent. I thought the filmed version released in, I’m pretty sure, 1984 (amazingly!) was really rather excellent. It was Richard Burton’s last movie, and John Hurt is also excellent (when isn’t he?!?). Jean-Luc Godard’s ALPHAVILLE (I am not generally all that keen on Godard) incorporates some interesting aspects of Orwellian ideas on perversion of language. A fascinating low-budget project, really. It’s set in “the not so distant future” but spent zero francs on constructing futuristic sets. They simply shot in the more-modern, glass and steel buildings extant at the time and the motor vehicles are the contemporary ones. Hi Greg: Totally agree on the movie “1984,” which I saw at the theater. I have a vivid recollection of the “Two Minute Hate” scene; also of the drabness and sameness of society, and of the stunning vivacity of Julia in the verdant countryside. What a contrast! At least Winston had a sliver of happiness before he was turned. Not many movies stay with me like that. “… It greatly confuses the issue to assume … that social status is determined solely by income. Economically, no doubt, there are only two classes, the rich and the poor, but socially there is a whole hierarchy of classes, and the manners and traditions learned by each class in childhood are not only very different but – and this is the essential point – generally persist from birth to death [emphasis added]. Hence the anomalous individuals that you find in every class of society. … you find petty shopkeepers whose income is far lower than that of the bricklayer and who, nevertheless, consider themselves (and are considered) the bricklayer’s social superiors; you find board-school boys running Indian provinces and public school men touting vacuum cleaners. If social stratification corresponded precisely to economic stratification, the public-school man would assume a cockney accent the day his income dropped below £200 a year. But does he? On the contrary, he immediately becomes twenty times more Public School than before. He clings [emphasis added] to the Old School Tie as to a life-line. And even the [“H”-less] millionaire, though sometimes he goes to an elocutionist and learns a B.B.C accent, seldom succeeds in disguising himself as completely as he would like to. It is in fact very difficult to escape from the class into which you have been born [emphasis added]. As prosperity declines, social anomalies grow commoner. You don’t get more [“H”-less] millionaires, but you do get more and more public-school men touting vacuum cleaners and more and more small shopkeepers driven into the workhouse. Large sections of the middle class are being gradually proletarianized; but the important point is that they do not, at any rate in the first generation, adopt the proletarian outlook [emphasis added]. Here am I, for instance, with a bourgeois upbringing and a working-class income. Which class do I belong to? Economically, I belong to the working class, but it is almost impossible for me to think of myself as anything but a member of the bourgeoisie. And supposing I had to take sides, whom should I side with: the upper class which is trying to squeeze me out of existence, or the working class whose manners are not my manners? It is probable that I personally would side with the working class. But what about the tens or hundreds of thousands of others who are in approximately the same position? And what about that far larger class, running into millions this time – the office-workers and the black-coated employees of all kinds – whose traditions are less definitely middle class but who certainly would not thank you if you called them proletarians? All of these people have the same interests and the same enemies as the working class. All are being robbed and bullied by the same system. Yet how many of them realize it? When the pinch came nearly all of them would side with their oppressors and against those who ought to be their allies. It is quite easy to imagine a middle class crushed down to the worst depths of poverty and still remaining bitterly anti-working class in sentiment; this being, of course, a ready made Fascist Party [emphasis added]. In the United States, the Republican party understands this analysis and acts upon it ruthlessly. The Democratic party, as Orwell said of the democratic socialists of England, does not seem to know how to forthrightly address this “divide and rule” strategy in order to unite the working and middle classes around their common economic interests. Orwell’s Animal Farm and 1984 both address this analysis as well, but people tend to overlook this because they think that novels or fables only deal with the imaginary and not with the very real economic and cultural foundations of Fascism, which today in the United States constitutes the gravest of threats to the nation. I consider 1984 one of the most profound books ever written, but The Road to Wigan Pier deserves a much wider reading audience than it has gained to date. Global Oligarchical Fascism, not Communism, represents the truly real and threatening form of Totalitarianism facing the world today. Now, let us speak of Orwellian perversion of language on this side of the Atlantic. A couple or three decades ago, when labor unions still had some muscle and the US auto industry was relatively healthy, a worker on the assembly line in a Detroit suburb, with enough overtime, could probably gross over $100,000 in a year. So he (most likely this would be a male worker) bought a nice suburban home and a gas-guzzling vehicle for every adult member of the family. Ah yes, the American Dream! And, with Nixon’s and Reagan’s encouragement, he declared himself a member of THE MIDDLE CLASS. But wait, isn’t he just a prole selling his labor power to the carmaker? He doesn’t own his tools, does he? They remain on the plant floor for the next shift to pick up and use, true? And this is how the all-pervasive myth that INCOME determines one’s social CLASS was spread in this society. It is the British situation exponentially magnified. (And Britain to this day still has more class consciousness in its working class than the USA.) The proletariat is the vast majority, the proles keep the machinery of the economy and government running; the proles thus POTENTIALLY [I am forced to use all upper case letters for emphasis, as I don’t know how to introduce boldface or italics into these posts] have the power to overthrow the status quo. This is the role socialists foresaw them seizing. And thus the supreme importance for the ruling class of confusing the working class and leading them into mindsets and voting habits that actually work against their best socio-economic interests. This is the brilliant triumph of capitalism in the USA in my lifetime. A stunningly successful job of brainwashing. Racism and sexism are the ugly servants of these efforts to divide and maintain rule. How is a working class that doesn’t even recognize itself in the mirror going to make a revolution? Hi Greg: I’ve been meaning to write about this — the decline until death of working class identity. I call it the divide, distract, and downtrodden strategy. First, divide the working classes. Turn them against one another. Have them fight against each other for jobs (outsourcing ensures job shortages in the USA, as does the constant push for higher profits at the expense of labor through automation and efficiency, i.e. make people redundant, as they say in Britain). Distract them with sports and patriotism and other diversions that keep their minds off of their plight. And keep them downtrodden. Even when they have jobs, don’t pay them a living wage; make them work two or three jobs, make them scrape for everything, even their health care. If you keep them divided, distracted, and downtrodden, you don’t have to fear a revolution. So far, the three-D strategy seems to be working quite well for the rulers, don’t you think?